This is incredible. The Icelandic fishing town of Ísafjörður has painted a new zebra crossing so that it appears to be 3D. Now I want to go to Iceland, just to cross the road. Last year I mentioned that the Olmense Zoo (which is handily close to us) now has insectburgers on the menu. And on Saturday we were in the zoo at lunchtime, so I gave one a try. The texture is very meaty. So much so that, if it wasn’t for all the signs promoting the fact that the burger is made of mealworms, I probably wouldn’t have realised there was anything out of the ordinary about it at all. The taste of the burger is not particularly strong, and pretty much overwhelmed by the barbecue sauce that was included with the burger. It’s certainly not unpleasant, it’s just not much of anything. Of course, the crucial question with something like this is: would I eat it again. The answer is a resounding yes. Insects are high in protein and a lot less fatty than beef and pork, they can also provide an equivalent protein yield for far fewer resources. The only downside is cultural – we, in the west are not used to eating insects and tend to have a ‘yuck’ response when faced with the idea. Serving them as a burger gets around this very neatly indeed. Now all the world needs is a for someone to invent the chili con mealworm. St00mgroep Turnhout is an association, run by amateurs, devoted to the construction, maintenance, care, expansion, improvement and operation of a miniature railway for passengers, especially for 5″ and 7″ gauge. The association promotes interest in and construction of technical models of vehicles with any means of propulsion, and with a special emphasis on railway vehicles. The weekend of May 23rd to 25th saw their 34th International Steam Meeting, and much fun it was, too. Obviously, we went as non-participants (or regular members of the public), which meant that we could ride the trains and take in the sights of the event. I shall admit now that the photo at the top of this post was lifted from the event’s 2014 gallery. It isn’t easy to take a photo of a miniature railway when you are sitting on a miniature train. But here are a few pictures I did take while wondering around the event. Some ladies in a tree. I have no idfea why. A pair of cavemen riding a wild boar. Obviously. Bubbles. You can never go wrong with bubbles. The miniature trains run from the first Sunday of April until the last weekend of September, every Saturday, Sunday and holidays from 1:00pm to 6:00pm. I suspect we will return to the City Park before the summer is over. Yesterday, we took a trip to the zoo. It’s handily close and we were able to go by bike and, after much wondering, we stopped for ice cream. While there, I noticed a large sight in the zoo’s restaurant advertising Insect Burgers as a tasty alternative to meat and fish. This struck me as quite a good idea. Much has been said about insects being a much more efficient source of protein than raising large animals, but many people react to this with a “Yuck”. Grinding the bugs up and turning them into burgers gets around this quite nicely – a burger is a burger and there isn’t much in a protein patty for most people to object to. I mentioned this on the Fediverse and that triggered a discussion that was both lengthy and interesting and managed to derail it self into total tripe. Wanting to know a bit more, I took an online look around this morning and found this (in Dutch). The Olmense Zoo started serving insect burgers in March of this year and, from the article, it looks like the people behind the burgers were thinking what I thought when I saw them. According to Robby Van der Velden, a biologist at the zoo, insects are high in protein and a lot less fatty than meats such as pork and beef. Although eating insects is not obvious in western society, it can certainly catch on if the meat is processed. Van der Velden also makes the point about insects requiring much less environmental resources and provides some numbers: To produce a kilo of beef, you need 14 kilos of grass, while a kilo of insect meat only needs about two kilos of grass to produce. It was too late in the day, yesterday, for me to give this a try. But when we go again, and if we are there at lunchtime (which is highly likely) I will certainly order an insect burger, just to see what it’s like. Another month, another holiday and this time we’re enjoying a rather pleasant time in sunny Wales. So sunny, in fact, that we were able to spend most of Wednesday in Cardiff’s Roath Park. There is a lake, though, so it was probably inevitable that young Macsen would want to go and take a look at the ducks. All was well and good until Macsen realised that the two girls nearby were feeding the ducks. Fortunately the crisis was averted by the girls’ very pleasant young mother who happened to have a spare slice. 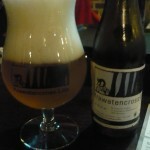 Following on from the previous post, this evening I have been mostly drinking Krawatencross beer. I’d never heard of it before but, since it is the Luihoeve’s beer of the month, I thought I’d give it ago. The beer itself is fine. It’s light and refreshing, a little darker than Duvel with a slightly stronger flavour and a much lower alcohol content (5.5%). It’s the sort of beer that I would quite happily drink all night without feeling any real desire to track it down again. I was, however, quite struck by the beer’s logo so I looked it up. It’s a cyclocross event and from the videos on the site it looks to be quite a good one. We’re too late to see it this year but it’s something worth bearing in mind for next year. Or 2014. They have a jeugdinitiatie which accepts entrants from the age of six.